The following article is the first part in a two-part travel essay from Iran’s Khuzestan province written by guest contributor Kamyar Jarahzadeh. Jarahzadeh is a student at UC Berkeley focusing on migration and forced migration in Turkey and the Middle East. Previously he has written about race politics in southern Iranian music as well as the language politics of Diasporic Iranian pop music. All photographs were taken by Kamyar Jarahzadeh unless otherwise noted. Check out Part 2 here. What is Khuzestan? To start, it is one of Iran’s 31 provinces. Khuzestan sits in the southwest corner of the country, sharing a border with Iraq to the west and the Persian Gulf to the south. However, Khuzestan, being Khuzestani, and how non-Khuzestanis perceive people from the province often seem so distinct that they cannot be collapsed into one another. To Iranians from the capital or other major cities, the province of Khuzestan is known for some combination of three things. These are its imagined substances, so to speak. First, for being the center of the worst fighting in the Iran-Iraq War. The war essentially began with Saddam’s successful invasion of Khorramshahr, and his failed siege of Abadan is attributed to the courage of the men, women, and children who took up arms to defend their own city. Map of Khuzestan revealing how the region’s location in southwestern Iran straddles the lines between Iranian and Iraqi cultural zones. 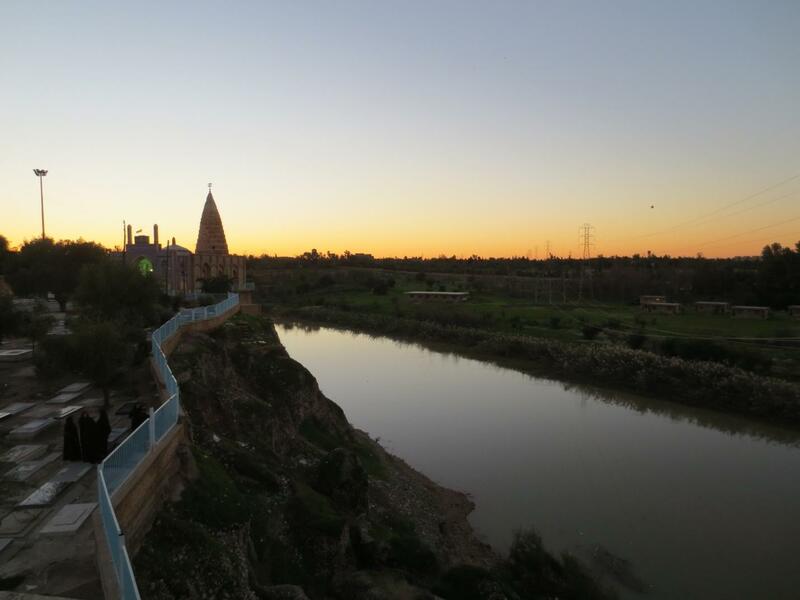 Second, Khuzestan is also known as an ethnically diverse mix of ethnic groups like Arabs, Lors, Qashqais, and Persians. To say “I am from Khuzestan” leads some to assume that you are non-Persian, ethnically. Amongst these characteristics, however, is also the designation of Khuzestan as a periphery. The province is located far southwest in the country, and to some it is known in its totality as simply a “shahrestan” (something that translates as town, but really connotes “backwater”). As an Iranian-American with parents whose heritage is from Khuzestan province, the Khuzestan I came to know and identify with was quite different. I was always fascinated with how many different associations this region had with different people. To have roots in Khuzestan is to know its history and the life its history has taken on more intimately than other Iranians. Khuzestan has been significant for empires since the ancient Elamites (2700-539 BCE), but more recently, its proximity with the Basra province in Iraq has produced a unique history that blends the social categories of Persians, Lors, Arabs, and Qashqais. Even the term “Ajam,” which historically denoted the entire region of Khuzestan and Basra provinces but has more recently been applied exclusively to the region’s Persian inhabitants, still takes on diverse meanings of its own in local usage. What does it mean to call the southwest of Iran your home? On my most recent trip to Iran, I made sure to visit Khuzestan and the various cities in which my family resided to make sense of it all. The idea of treating Khuzestan as both a place of intersections as well as a coherent idea in itself can be traced all the way back to antiquity, as Khuzestan is the home of the very early “Iranian” Elamite empire. From the 17th to part of the 20th century, the province or at least parts of it were actually known distinctly as Arabistan and in Arabic is often still referred to as Al-Ahwaz, after the region’s largest Arabic-speaking city. However, the modern sense of a connection between all of Khuzestan lies in the lives of its people. My own family and those of many other Khuzestanis often have connections throughout various cities in the region. It was also not uncommon for families, like my own, to have moved from one part of the province to another during the Iran-Iraq war. 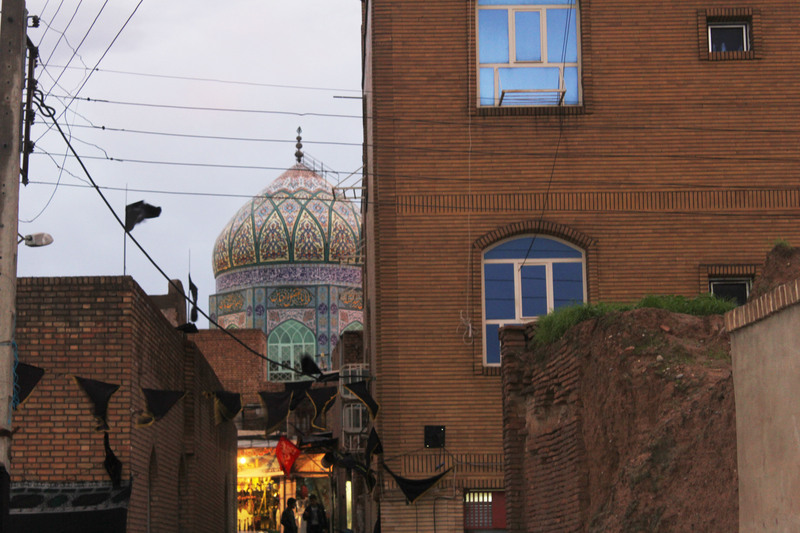 Masjid Darvazeh above Dezful’s old bazaar, with nearby streets draped in black flags commemorating the month of Muharram. The first stop on my Khuzestan journey was to my father’s hometown, Dezful. As far as my father’s family is able to trace its lineage, we have been in Dezful. This city had important roles in the rules of various empires as it is in prime geographic location: the river on one side and mountains on the other historically maintained Dezful as easily defensible. This characteristic leaves Dezful with remnants from every major Iranian historical era: pre-Sassanid water mills, residents who claim descendants from the Timurid invasions, and Safavid and Qajar architecture. Despite this rich history, modern Dezful is often mocked as a village in comparison to Tehran. Dezful today, however, is just like any Iranian city with constant construction, roads, and a traffic problem. But still, I wanted to understand the Dezful that occupies people’s imaginations and still lives in on my families’ stories of their childhoods. With this goal in mind, there was only one place to start: the River Dez. The retro-fitted bridge in Dezful claimed to be of Roman origin. While the left side of the bridge has been rebuilt using modern technology, the right half supported by arches is still original. In the minds of Dezfuli people, the river is, or at least was, the center of life. 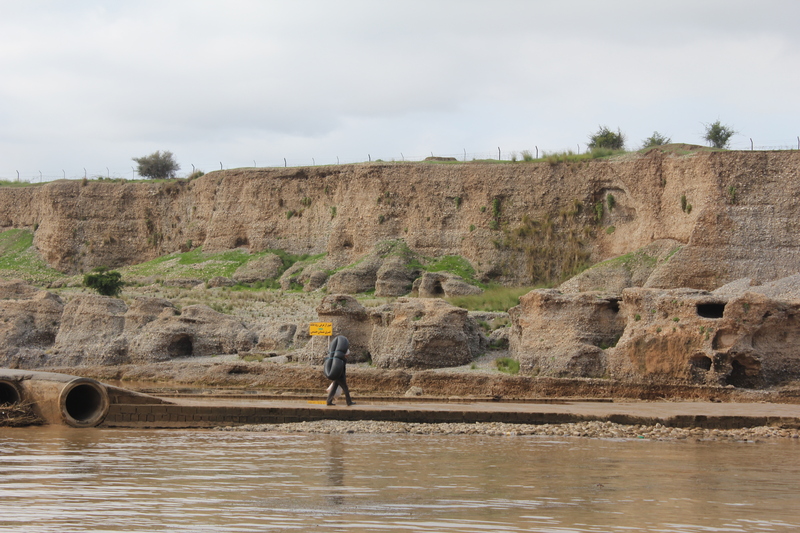 Family members and friends gave me many different meta-histories of the city with various degrees of historicity that all had one key element: the Dez River is the “reason” for Dezful’s existence. This can be seen by the water mills that were created in the 3rd century BC and that were still in use in the 1400s. 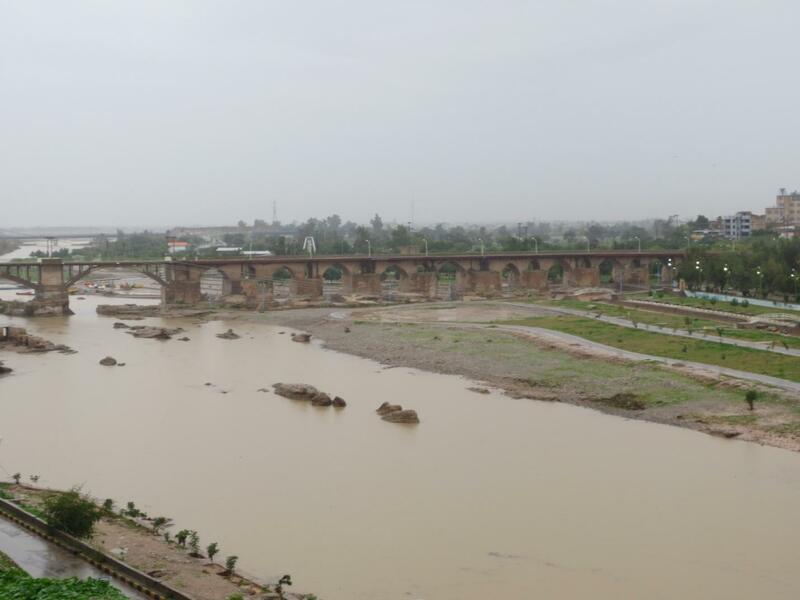 And as far as many Dezfulis are concerned, the river still is Dezful. For my entire life, my father and his family would recount stories of spending entire summers in the River—a sort of survival technique when in July, the temperature can average 115 degrees Fahrenheit (46 degrees Celsius). In the Summer months, the holes pictured in the hills near the lake are places families gather to picnic and beat the heat. This year, however, the heat has reached as high as 127 degrees Farhenheit, dampening the enthusiasm of many picknickers. One of the most important places in Dezful linked to the river is Masjid Rudband—a shrine for a historical figure by the name Khawaja Sultan Sayyid Ali who lived sometime in the 15th century. Although there are various formal accounts of Rudband’s life, they are in contention. What interested me most, then, is that in Dezful every relative, friend, or acquaintance I asked about the man and his shrine had a different story. Some described him as an Imamzadeh (descendant of one of the 12 Shia Imams), some as a Sufi, some simply as a religious scholar, and some as an engineer who knew how to build dams. Accompanying the mosque is also a legend: that Rudband somehow stilled the water in this small part of the river Dez—an anomaly on this very fast and dangerous river. As you can see in the picture below, the water is indeed at it’s calmest right around the mosque! Masjid Rudband overlooking the Dez river, with the cemetery also in view. Regardless of the history behind the place, the mosque’s cemetery has a special place in my heart: it’s where my grandfather is buried. I never had the chance to meet him, but every time I travel to Dezful my father and I visit his grave and I find myself trying to make sense of my place in the world. On this last trip, as I shed tears over the grave of a grandfather I never knew, I couldn’t help but ask myself what it meant to have such a strong connection to a place that my father left and I only understood from a few trips and my relatives’ memories. Dezful is at the same time a very easy and a very complicated place to love. Among the newly constructed apartment buildings lie many Safavid and Qajar era homes based off of very complex architecture that allowed people to live in different parts of the house during different seasons, taking into account factors like the direction of the sun in order to maximize heat in winter and coolness in summer. To walk through these neighborhoods and through these homes (with the owners’ permission of course!) is to travel through a beautiful past that locals still proudly claim as their own. Interior of a Qajar-era home in Dezful. A family still lives in the restored home. Yet all around me, there were also some reminders of what daily life was actually like not just in the 15th or 18th century, but even just a generation or two ago. Adorning many homes were two door handles as pictured below: a large one for men to use and a small one for women. The handle that the visitor used would inform the woman inside of the visitor’s gender, which would in turn let her know whether or not to cover herself before answering the door. 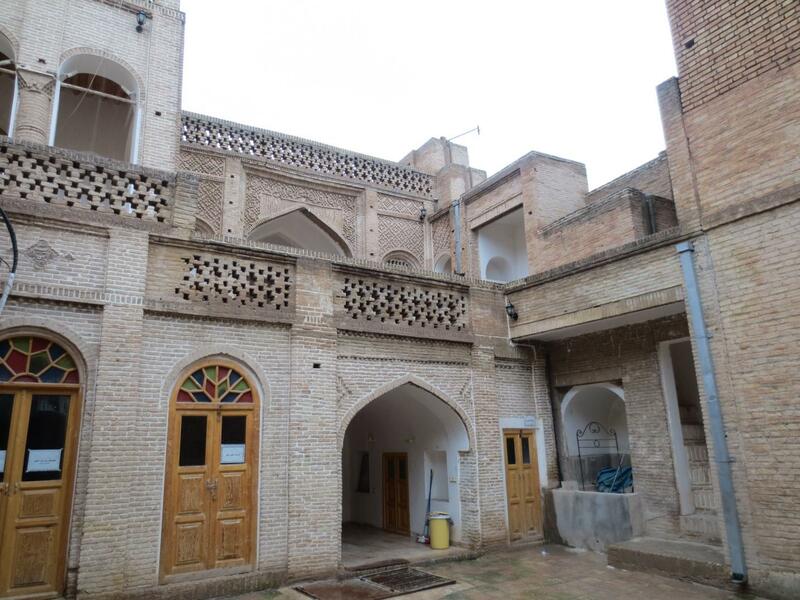 Gendered rules in society are quite common, but unique to places like Dezful is the ways in which architecture or customs developed to facilitate daily life while respecting these rules. 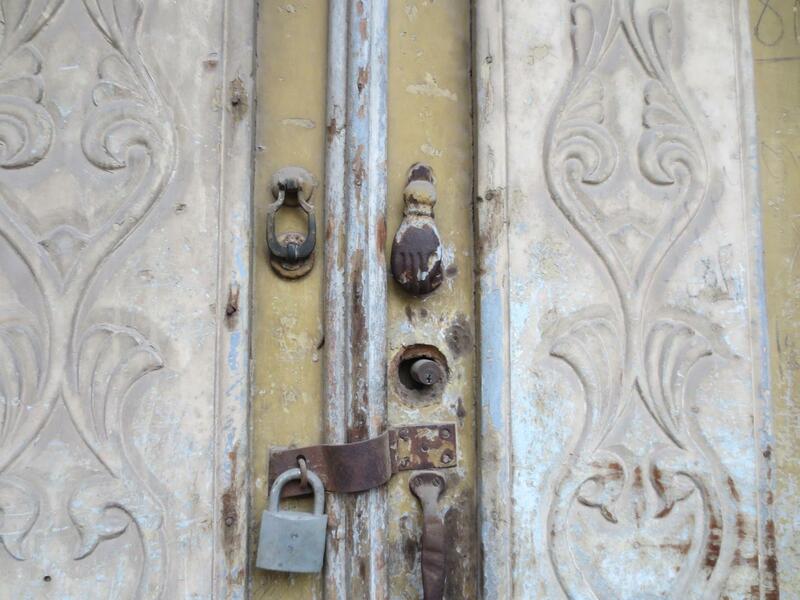 A door knob in the old style in Dezful, with a large knocker for men and a smaller one for women. Similarly, it was also custom for women to stick a finger in their mouths when speaking to male visitors: it was considered improper for a woman to let another man hear her normal voice, so women were encouraged to use the finger-in-mouth trick in combination with some sort of pitch alterations. Indeed, if you travel to Dezful and ask someone about this, they will humorously attempt to reenact the practice. Indeed Dezful is known not just as a conservative place, but a deeply devout one as well. Khuzestan in general has very special mourning ceremonies for the commemoration of the death of Imam Hussein at the Battle of Karbala, a ritual whose remembrance is particularly important for Shia Muslims. 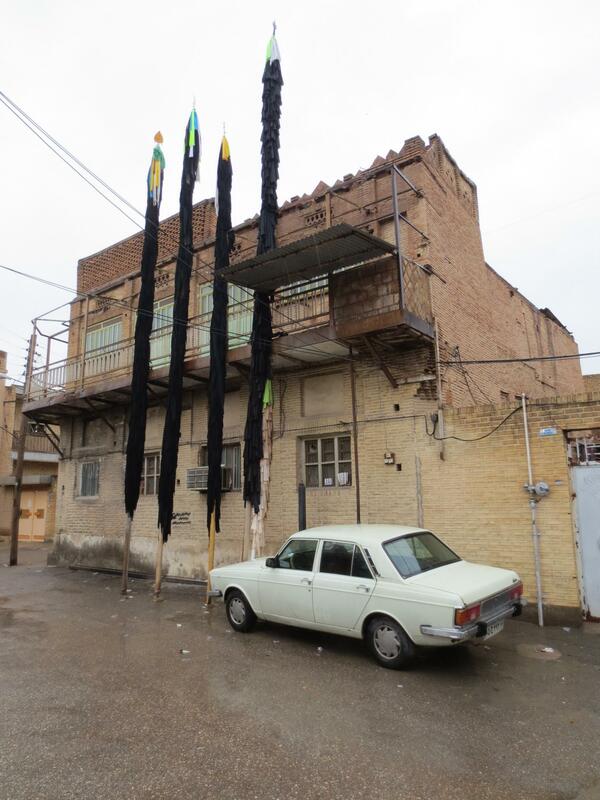 One ritual not found in Tehran but unique to Dezful (and certain parts of South Asia) is the use of alams, or giant sticks that are either held in the hand or attached to a mourner’s waist during street parades. They are not only extremely tall, as pictured below, but even heavier than one could imagine. Despite this, many of my relatives recounted how as young men attempting to prove their might, they would proudly grab the shorter alams in just one hand and raise them up into the sky as onlookers cheered. The practice is more spectacle than danger, however: the larger alams are attached to two safety-sticks (carried by other people) that can be used if the alam begins to fall. This too, however, consistently generates a wave of shouts and excitement as a falling alam is successfully rescued. On the day of the commemoration of Ashura, alams are carried to various locations in Dezful and left on display. Some of the shorter alams are made to be held in one’s hand, while the larger ones are built to be carried with special waist supports. Old traditions still abound in Dezful, like greeting passengers when you board a city bus. Yet overly-conservative practices that no longer exist are now seen as norms that have been successfully challenged by the women in society. My own grandmother recalls rules about the role of women in society (such as the concealing of one’s voice) with laughter that suggests yes, these practices were part of our culture, but now they are part of our past. Unfortunately, it is common for some outsiders unfamiliar with Dezful to consider the town as rural, periphery, and to some degree stuck in the past. However, to visit Dezful is to see a city that has an active and developed understanding of its own history. As I continued my travels through Khuzestan, outlined in part two, I encountered even more history tied intimately to constantly developing understandings of the past. Continue on to part 2 of the photo series here. I’m from Iraq and I live in the US now. It was very interesting to read this article about the city of Dezful. 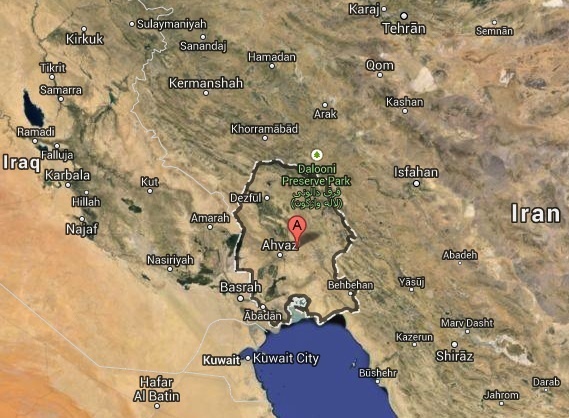 My father’s family is originally from the city of Dezful. My great grandfather moved and settled in Iraq.I have a lot of curiosity about this city because of my family’s heritage and I would like to go and visit Dezful someday soon Insha’llah.